The Republican sweep of both the White House and Congress creates the opportunity for President-elect Donald Trump to implement the majority of his economic policies. To put this into perspective, a study by Moody’s Investors Service estimated that should Trump’s policy initiatives be fully implemented, such as tax cuts, capital repatriation, higher defense spending, protectionist tariffs, the mass deportation of undocumented immigrant workers, and no change to entitlement spending, the U.S. budget deficit would increase by approximately 7 trillion dollars, pushing the federal debt/GDP ratio from its current 74% to 100% by 2020.1 It is anticipated that these policies could lead to an increase in GDP growth, more inflation, higher interest rates, a steeper yield curve, an extension of the business cycle, tighter credit spreads, lower default rates, a stronger U.S. dollar, and greater volatility in the equity market. We are considering the outcomes of Trump’s policies, but more specifically, we are evaluating how the new Trump administration could impact convertible investors. Global convertible new issuance also typically increases when interest rates rise, as convertibles become increasingly a more attractive financing option when compared to straight fixed income alternatives. Although Trump’s policies may lead to greater economic growth, and by extension higher earnings and stock prices, this could be offset by a rise in interest rates and a stronger U.S. dollar. Under such conditions, stocks with higher growth rates, which may allow them to protect margins even in an inflationary environment, could outperform. As shown in Figure 2, growth stocks dominate issuers in the convertible market because growth companies are frequently in need of capital. Convertible securities serve as an ideal financing tool for these issuers because as the share price rises, the convertible, which was previously sold at a premium to the existing share price, can be exchanged for stock, thereby strengthening the company’s now enlarged balance sheet. While the convertible market has significant exposure to growth companies, it is noteworthy that the convertible issuers’ growth rate is typically faster than the growth rate of issuers in other markets, as illustrated in Figure 3. If Trump’s policies result in a steeper yield curve, capital repatriation, and less government regulation the financials, technology, and healthcare sectors would benefit, respectively; all of which are included in the Top 5 Growth Sectors. Trump’s economic policies, if they are successful in increasing nominal economic growth into the 2-6% range, could extend the expected life of this credit cycle by several years. The excess return of corporate debt over Treasuries tends to be higher during periods when nominal GDP growth, currently 2.8%, is expanding as default rates fall and credit spreads tighten. This market environment is advantageous for the convertible asset class as the fixed income component of convertibles will benefit from stable-to-improving credit spreads. Capital Economics estimates that U.S. companies are hoarding 2.5 trillion USD overseas, or about 14% of GDP5. Should a Trump tax policy encourage some of these funds to return home, it is likely that a portion would be used for merger and acquisition activity or to return cash to shareholders in the form of stock buybacks and dividend increases. There are two ways in which convertible investors could benefit. First, since there is a significant number of convertible issuers with market capitalizations under 10 billion USD, they often make attractive targets for larger suitors. In fact, year-to-date, there have been 21 such transactions including Oracle’s purchase of NetSuite, Qualcomm’s acquisition of NXP Semiconductors, and Medtronic’s takeover of HeartWare. Second, over the last ten years, convertible securities have undergone a significant positive structural transformation whereby investors typically receive more shares in the convertible when a company raises its dividend or is acquired, which allows convertible investors to better enjoy the fruits of a takeover premium alongside equity investors. 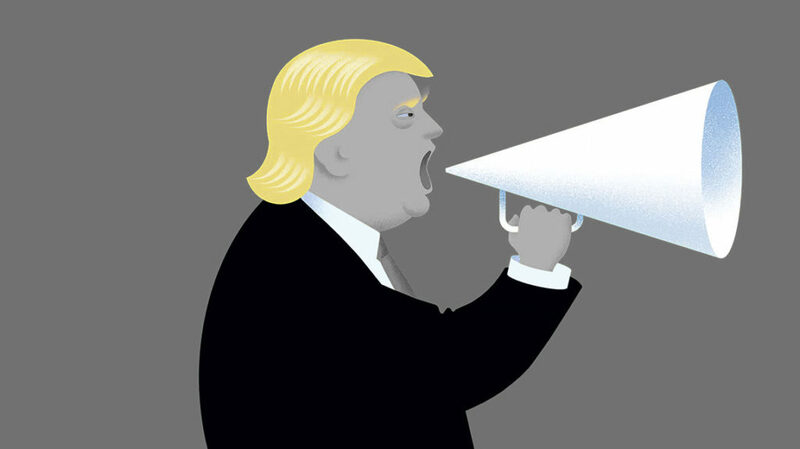 Trump’s policy initiatives, both domestic and foreign, are only likely to exacerbate the possibility of increased equity market volatility already provoked by differing central bank monetary policies, forthcoming political contests in Europe, commodity price fluctuations, and concerns in emerging markets. As an asset class, convertible securities are beneficiaries of rising volatility as the embedded equity component becomes more valuable, all else being equal. Because convertible securities become more bond-like (defensive) when equities fall, but more equity-like when they rise, convertibles demonstrate positive asymmetry, or structural alpha, that is difficult to replicate. 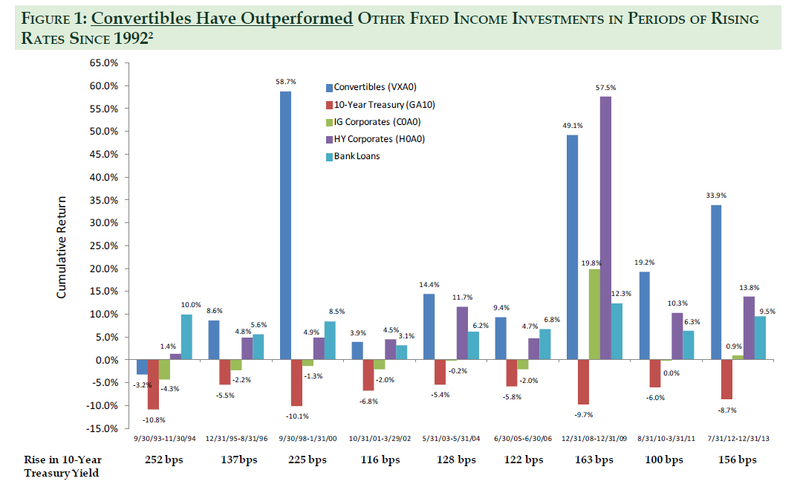 Although often overlooked, convertibles are a separate asset class that have a long track record of delivering equity-like returns with less risk and lower correlation to equity and fixed income securities. Consequently, convertibles add value when included in either a bond or stock portfolio. As the Trump Era unfolds, convertibles offer a unique solution for improving the diversification and positive asymmetry of a portfolio. 1 Robis, R. (Ed.). (November 2016). Is the Trump Bump To Bond Yields Sustainable? BCA Research.pg. 5. 2 Bank of America Merrill Lynch Convertible Research; www.federalreserve.gov; Bloomberg, Credit Suisse. VXA0 is the Bank of America Merrill Lynch All U.S. Convertibles Index. GA10 is the Bank of America Merrill Lynch Current 10-Year U.S. Treasury Index. C0A0 is the Bank of America Merrill Lynch Corporate Master Index. H0A0 is the Bank of America Merrill Lynch High Yield Master II Index. Bank loan performance is represented by the Credit Suisse Institutional Leveraged Loan Index (CSILL). Periods of rising interest rates are defined as an increase in the 10-year Treasury Yield of 100 basis points (1%) or more. Information is shown for the periods since the inception of CSILL on January 1, 1992. 5 Hunter, Andrew. (September 19, 2016). US Economic Update. Capital Economics. This document is approved for publication by Advent Capital Management, LLC (Advent) and Advent Capital Management UK Limited (Advent UK) and includes infor­mation about an Advent investment strategy and/or an Advent-managed separate account or collective investment vehicle (collectively, an Account). Advent is registered with the U.S. Securities and Exchange Commission as an investment adviser. Advent UK is a wholly-owned subsidiary of Advent and is Authorized and Regulated by the UK Financial Conduct Authority. The information in this document is intended exclusively for current investors in an Advent investment strategy or Account and is for informational purposes only and in particular may not be used in making any investment decision. This document is not, under any circumstances, intended for distribu­tion to the general public. This document is confidential and may not be reproduced (in whole or in part) in any manner without the written permission of Advent. No investment advice, financial advice, tax advice, or legal advice is provided through this document, and no person is authorized to use this document for those purposes. Therefore, this document is not a recommendation to invest in any Advent investment strategy or buy or sell units or interests (Interests) in an Account. Any discussion or information herein relating to investment processes, portfolio characteristics or other matters relating to Advent or an Advent investment strategy or Account is subject to change over time. Opinions and any forecasts of future events, returns or results expressed in this document reflect the opinion of Advent, are subject to change without notice, do not reflect actual investment results, are not guarantees of future events, returns or results and are not intended to provide financial planning, investment advice, legal advice or tax advice. Although this document, including any third party information, has been prepared using sources, models and data that Advent believes to be rea­sonably reliable, its accuracy, completeness or suitability cannot be guaranteed and should not be relied upon as such by any person. Neither Advent nor any of its affiliates is under any obligation to update or keep current the information contained in this document and any opinions expressed in this document are subject to change without notice. Any views contained herein are based on financial, economic, market and other conditions prevailing as of the date of this document. The information contained in this document does not purport to cover all matters that may be relevant for the purposes of considering whether or not to make any prospective investment. Prospec­tive investors should conduct their own investigations in relation to the matters referred to in this document and are recommended to consult their own advisers in relation to such matters. No responsibility or liability is accepted by Advent or any of its officers, agents or advisors as to the accuracy, sufficiency or completeness of any of the information or opinions, or for any errors, omissions or misstatements, negligent or otherwise, contained in or excluded from this document (except to the extent that such liability arises out of fraud or fraudulent misrepresentation). Therefore, the information in this document is supplied on an “AS IS” basis and NO WARRANTY IS MADE AS TO ITS ACCURACY, COMPLETENESS, NON-INFRINGEMENT OF THIRD PARTY RIGHTS, MERCHANTABILITY OR FITNESS FOR A PARTICULAR PURPOSE. Information in this document must not be used in any jurisdiction where prohibited by law and must not be used in a way that would be contrary to local law or legislation. The information in this document does not constitute an offer to sell or a solicitation of an offer to buy an interest in Units or any other security that may be referenced herein. Persons receiving a copy of this document in any jurisdiction may not treat this document as constituting an offer, invitation or solicitation to them to subscribe for Units not­withstanding that, in the relevant jurisdiction, such an offer, invitation or solicitation could lawfully be made to them without compliance with any registration or other legal requirement. Any entity responsible for forwarding this material to other parties takes responsibility for ensuring compliance with applicable securities laws. It is the responsi­bility of any persons in possession of this document and persons wishing to apply for Units to inform themselves of, and to observe, all applicable laws and regulations of any relevant jurisdiction. Unless otherwise indicated, no regulator or government authority has reviewed this document or the merits of an Advent investment strategy or Account. Past performance and hypothetical performance does not guarantee, and is not a reliable indicator of, future results and the performance of the Account may be substan­tially different. Current performance may be lower or higher than performance shown. The performance of an Advent investment strategy or Account may be volatile, and an investor could lose all or a substantial portion of any investment made in an Advent investment strategy or Account. No representation is given that an Advent investment strategy or Account is suitable for any particular investor. Market conditions can fluctuate and vary widely over time and can result in a loss of portfolio val­ue. It should not be assumed that results for historic or hypothetical portfolio investments or investment strategies will be achieved for other investments in the future. No guarantee or representation is made that any Advent investment strategy or Account will achieve its investment objective or have positive returns. Investments may be in a variety of currencies and therefore changes in rates of exchange between currencies may cause the value of investments to decrease or increase. Furthermore, the value of investments may be adversely affected by fluctuations in exchange rates between the investor’s reference currency and the base currency of the investments. In­vestments in derivative investments carry certain inherent risks such as the risk of counterparty default and before investing you should ensure you fully understand these risks. Use of leverage may also magnify losses as well as gains. Returns presented on a gross basis are substantially higher than returns presented on a net basis because gross returns do not reflect the deduction of investment advisory fees and other expenses that would be incurred by a client. The returns of a client investment in any in­vestment strategy will be reduced by the advisory fees and any other expenses it may incur in the management of its account. Advisory fees have a compounded effect in reducing account performance over time. Investing in financial markets involves a substantial degree of risk and there can be no guarantee that the investment objec­tives of an Advent investment strategy or Account will be achieved. Investment losses may occur, and investors could lose some or all of their investment. This document may contain certain forward-looking statements. In some cases forward looking statements can be identified by the use of terms such as “believes”, “estimates”, “antici­pates”, “projects”, “expects”, “intends”, “may”, “will”, “seeks” or “should” or variations thereof, or by discussions of strategy, plans, objectives, goals, future events or intentions. By their nature, forward-looking statements involve risk and uncertainty because they relate to future events and circumstances. Actual outcomes and results may differ materially from any outcomes or results expressed or implied by such forward-thinking statements. The success or achievement of various results, targets and objectives is dependent upon a multitude of factors, many of which are beyond the control of Advent. No representations are made as to the accuracy of such estimates or projec­tions or that such estimates or projections will be realized. Actual events or conditions are unlikely to be consistent with, and may differ materially from, those assumed.